This brings forward a whole new set of issues though. 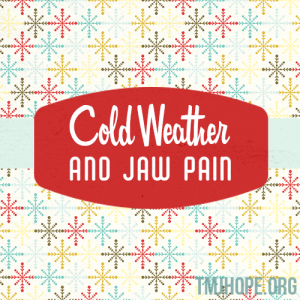 I don’t care what anyone says, the cold weather does make jaw pain worse. It’s interesting because studies haven’t really been able to prove it, yet every winter we have lots of people asking us how to bundle up during the winter to prevent more pain. Movement doesn’t just mean blood flow. There are so many benefits: improved mood, more energy, better sleep, etc. Try yoga, tai chi, qigong, or warm water swimming. When you’re stuck in the chronic pain cycle, you do less, which then causes your muscles to become tighter and weaker, which causes pain…then you think about the pain, and the cycle starts over. I know it can be difficult to start a new exercise, but start small. Could you go sit on your yoga mat and do a 5 minute stretching exercise today? Probably! Tomorrow, try 6 minutes. Another tip that helps me a lot is to stand up during the day while I’m working at the computer. I’m much more active this way because my body reminds me when it’s time to move. 2. Wear a scarf or hat. I love Buff’s, because they are lightweight yet still cover my ears. 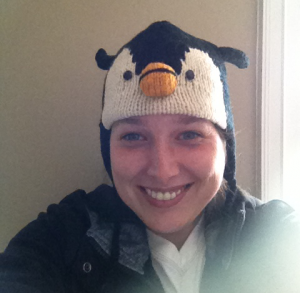 I’m also a huge hat fan (here I am in last season’s favorite hat). 3. Keep your heating pad handy. I like this one by Thermophore (I’ve been using it for at least five years!). I also use a heated throw blanket when it is really cold. 4. Are you getting enough good fats? There is evidence that Omega 3 fatty acids can help with many health conditions, including inflammation (the studies I read looked at rheumatoid arthritis and back pain). Omega 3’s are also present in cold water fish and nuts. Talk with your doctor before changing your diet or beginning any supplements. This might seem unrelated, but consider all the warm drinks you consume during the winter. Are they sweet? caffeinated? Probably (I know I’ve been known to drink a gingerbread latte…or 5). Caffeine doesn’t cause dehydration (that’s a myth) but water is still your best bet when you are trying to stay hydrated (it’s free, doesn’t have a ton of sugar or other additives, and it works!). If you don’t like the taste of straight water, do what I do – cut a couple lemon slices and float them in your water bottle. There’s something about the lemon that makes me drink 10x the amount I usually do! Tell me – what helps you when the weather turns cold? Wow. Thankyou. No one really knows what I go through every day but y’all seem to know. I drink alot of hot herbal tea. Ginger really helps joints!